Another possibility is to build your own affiliate website. Affiliate marketing is an interesting option because you can essentially earn money in your sleep. All you need is a website, traffic, and products you are willing to advertise. The rest sort of happens by itself. If that sounds good to you, in this article you will learn how to create your own affiliate website using WordPress. We will explain what affiliate marketing is, what kind of affiliate websites you can start, where to find products to advertise, how to set up the site and tools to do so. If you want to build your own affiliate website, your can choose several ways to do so, each with its own strengths, weaknesses, pros and cons. Here are some examples. Daily deals work in a way that you offer discounts on products for a limited amount of time. One of the most popular examples of this model is Groupon. 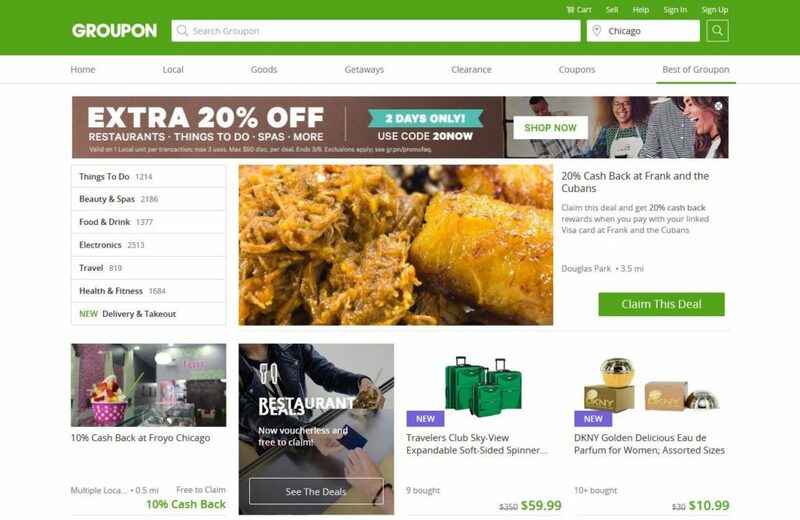 The site lets you purchase coupons for different businesses for a limited time that gets you steep discounts. Daily deals are a proven business model, however, they also come with some competition. If you go this way, much of your work will be trying to close deals with businesses to put on your site. Can be lucrative though! You know this kind of site. Search for a product and they provide you with prices from many different online shops and sometimes user reviews. When someone clicks through and makes a purchase, the site gets some percentage of the sales price. This option requires you to set up a system that collects and updates prices from all around the web. This can be complicated. However, once it is in place, much of it works automatically. A classic of the affiliate marketing world. Just sign up to an affiliate network of your choice, review products to help others decide whether to purchase them or not and place affiliate links inside your content. To make things even more helpful, you can also include other user reviews or compare products. In order to build your own affiliate website, you need to choose whichever option is the most fitting for you. Of course, you can also create a mix. Product reviews can also be a staple of a blog and vice versa. We will talk about this further below, however, before we can get started, we need to find products to sell. Let’s look at that next. When looking to sell affiliate products, you have the choice of two main avenues. These networks offer products for all kinds of niches from electronics, movies, books to online courses and much more. Almost anything you can think of you can find on here. The disadvantage: commission rates differ a lot. For example, Amazon, the biggest fish in the pond, only pays between one and three percent, slightly more if you bring in a lot of buyers. You will have to either make a lot of sales or only recommend high-ticket products to make this worth your while. A better idea might be to try and find companies in your niche who offer their own affiliate programs. For example, the WordPress sphere is full of them. From hosting providers to theme and plugin authors, many companies offer affiliate programs with healthy commission rates of up to 50 percent! The advantage this way is that it allows you to choose something you are passionate about or at least interested in. This is important since you will have to create a lot of content on your topic to rank well and sell products. If you are really bored by your niche or don’t care at all, this will be hard to keep up. To find companies, google “your niche + affiliate/become an affiliate/affiliate program”. ThemeIsle also has a list of WordPress-related affiliate programs. Ok, now that we know where to find products and have decided on our site type, it’s time to start building the actual site. This is not much different from setting up any other WordPress website: install WordPress, choose a theme, add plugins, and start creating content. However, in this case, you need to come up with content that will help you convert visitors into buyers. That means it needs to be high quality enough to be picked up by search engines and move visitors to take action. Review posts — You can build entire sites around just review posts. When doing so, try to bring something new to the table that visitors can’t learn anywhere else. Answer common questions and objections, try to be objective and helpful. Maybe offer alternatives to the product. Comparison posts — Find leading products in your industry and show how they compare to each other. Great content, especially if you have affiliate links for both of them. We did it here with two of the most popular SEO plugins (but without affiliate links). How-to posts — How-to posts offer lots of opportunities to include affiliate links. Show people how they can solve their problems and give them the tools to do so. If some of them are affiliate products, even better! Product roundups — Very popular content type. Combine several products from the same category in one post for plenty of earning opportunities. Especially if you update the article, it will continue bringing in traffic and income. While the ideas above are a good start, you can also place affiliate links in other places. Pages, case studies, interviews, and all other content where it makes sense. For example, a good idea is to create a resource page with everything you are advertising in one convenient place. However, as mentioned, you also need to engage in other activity to make your affiliate website a success. Don’t forget about web design, keyword research, SEO copywriting, site speed and other important markers of a high-quality websites. Of course, WordPress offers plenty of plugins and tools to make things easier. Here are a few of them. User reviews are a great way to supplement your content. They are an indicator of trust and move others to purchase. The plugins below can help you set them up. WP Review — Helps you create product reviews including star, point and percentage ratings. Compatible with Schema rich snippets. A premium version is available. WP Product Review Lite — Another review plugin, this one also allows readers to add their own reviews to your content. Includes options for affiliate links. Rich Reviews — Purely for user reviews. Includes rich snippets, the ability to moderate submissions and much more. All In One Schema.org Rich Snippets — Mark your own reviews with rich snippets for Google. Managing your affiliate links is paramount. For example, if one link changes it’s easier to be able to adjust it in one central place instead of having to go through your entire site and change all instances. Pretty Link Lite — A simple way to clean up your affiliate links. Generate your own shortlinks, track clicks on affiliate links and more. Thirsty Affiliates — Comprehensive link management tool. Insert links into content, cloak or insert them automatically. Can also tell you a lot about each link’s performance and a lot more. Amazon Link — Link management especially for Amazon products. Find products directly from the WordPress backend and send visitors to their local Amazon store. As mentioned, daily deals are a good way to earn affiliate income. Use the plugin below to create coupons for your own website. Magic WP Coupons — Plugin to easily set up coupons for different stores and insert them into content via shortcode. A premium version is available. Coupon Creator — Another plugin for coupon creation. Comes with multiple themes, expiration dates and a lot of other features. Yoast SEO — One of the best SEO plugins out there. Make your site magnetic for search engines. Check our detailed instructions here. MailChimp — Free email marketing service up to 2000 subscribers. Stay in touch with customers and send out your latest offers. Read our beginner’s guide here and instructions on how to link it to WordPress here. Rel Nofollow Checkbox — Don’t want to give affiliate links too much link juice? In that case, this plugin adds a simple checkbox to the WordPress editor to turn them into nofollow links. Affiliate marketing is a valid way to make money with WordPress. Advantages are plentiful, including low costs, low risk, and the ability to generate passive income. There are several ways to build your own affiliate website and a few business models to choose from. Whichever way you go, WordPress makes it easy to get started and gives you plenty of tools. However, keep in mind that it takes time. You probably won’t get rich over night. Affiliate websites need effort just like any other online business venture. However, if you keep moving forward, try out new things, learn and take calculated risks you are sure to find success in the long run. Do you have a WordPress affiliate website? Any other tools you can recommend or tips you have to share? Tell us in the comment section below!